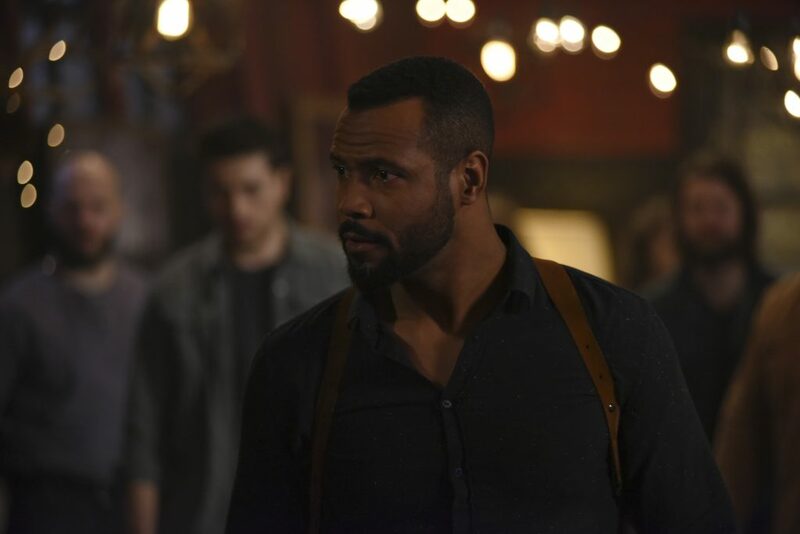 A killer runs loose in the shadow world in this week’s episode of Shadowhunters. Someone is murdering Nephilim and carving out their runes for extra brutality. It’s up to Jace, Alec, Izzy, Clary, and Simon to find out who is responsible before a Downworld uprising happens. Tensions are already high between Downworlders and the Shadowhunters after Jace accidentally activated the Soul Sword and Valentine used it to instantaneously wipe out a number of vampires, werewolves, and fairies whom had come to the aid of the squad. The first victim appears to be mauled by a werewolf and Luke is brought in for questioning on the orders of the Inquisitor. She brings up that he had just asked for the destruction of the Soul Sword for killing all those Downworlders and since they refused, she thinks this is motive for revenge. He defends himself and his pack saying that if anyone under him did this, he would kill the murderer himself. Angry, Luke gives a sample of his own DNA to prove that he had nothing to do with this. He is cleared and in order to assure Imogen that none of their friends could be responsible for this, they go off to seek DNA from the others. Alec goes to Magnus who is still feeling the effects of being tortured as Valentine. 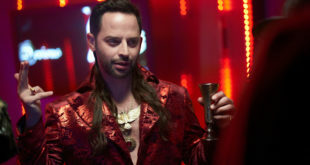 When his boyfriend comes in asking for a lock of hair to clear him as a suspect, the warlock is deeply hurt and disturbed that Alec doesn’t trust him enough. But the other man a young Shadowhunter who is conditioned to follow orders, even though he’s conflicted about it. Once Magnus gives him what he’s asked for, Alec is told to get out. Clary goes to Simon and he tells her about his grandmother who had survived the Holocaust. Because she had lived her life as a mundane and gone to school with him her entire life, Clary knows about the travesty that happened to the Jews during World War II. She quickly backs off, understanding that asking for his DNA on mere speculation was creature profiling and wrong. Clary convinces him to let her head back to the Institute by herself, but as they are chatting on the phone she gets attacked by a hooded figure. We find out that this villain had been somehow drugging the Nephilim so that they are unable to fight back. Luckily though, Simon rushes to her aid. Her mysterious attacker flees and the vampire takes her back to the Institute, only to be imprisoned because he refuses to leave her side. Meanwhile, Jace is being heavily influenced by Imogen, who appoints him head of the Institute since she is being called back to Idris. 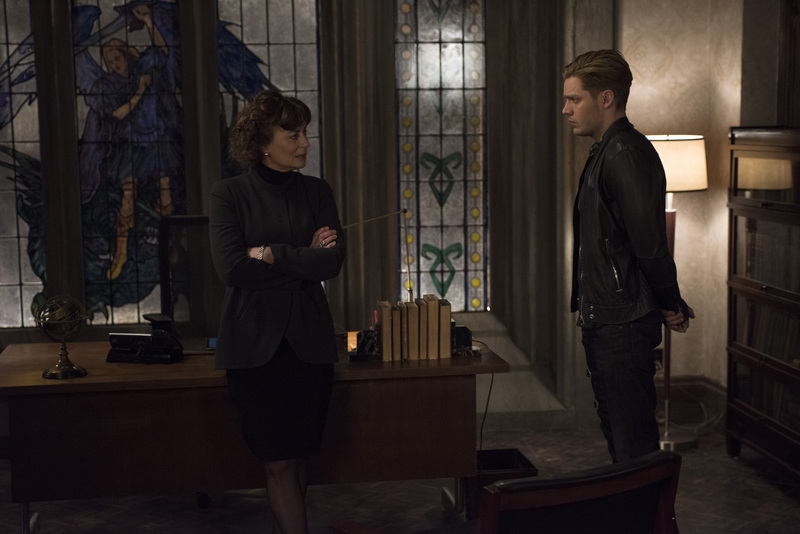 Obviously she’s playing favorites because he is her grandson and at the same time trying to manipulate him into seeing things her way, which is to put temporary tracking chips on Downworlders as more Shadowhunters are being found dead with their runes carved off. Wanting to please grandma and feeling a sense of duty that comes with his newfound heritage as a Herondale, Jace goes along with her plan and goes to the Hunter’s Moon. Things take an ugly turn though as Maia is livid that he would ask this, showing that the Nephilim must view Downworlders as nothing more than animals. Pissed as all hell, she begins to beat the crap out of him but then the other Shadowhunter with Jace manages to inject her with the GPS chip. Luke comes in and breaks the fight, saying that this is how a real uprising starts. Is that what they want? Wordlessly, Jace and his companion leave the bar. Note: Maia throws a mean punch folks, you do not want to be on her bad side. 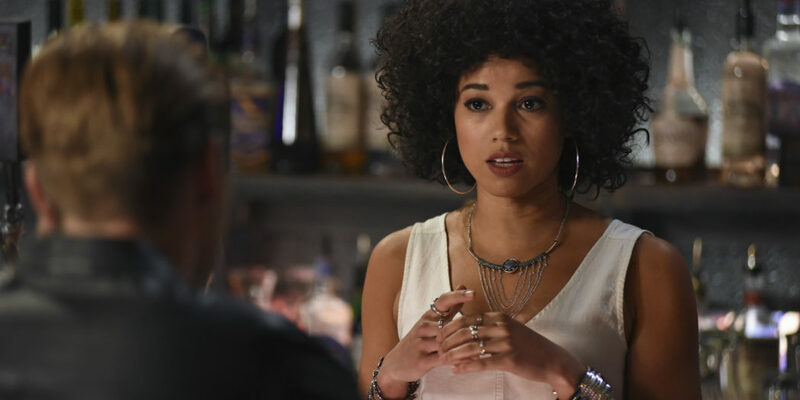 Speaking of which, Maia gets brought to the Institute because she is being accused to murdering another Shadowhunter since she was a block away from where the body was found. Clary accuses Imogen of letting fear blind her by wanting to track Downworlders and imprisoning Maia without real proof. However before she can say anything more the Inquisitor tells her that she is naïve and idealistic and asks her what she’s going to tell the families of the dead Shadowhunters. She then leaves for Idris and tells Jace to make her proud. Clary reminds him that it wasn’t too long ago that everyone thought he had demon blood and that if he wasn’t a Herondale Imogen would lock him up too. This finally wakes Jace up and he takes Clary to see Simon and apologizes to Maia for the tracking and being held prisoner. I’m totally digging this banter between the two. Izzy in the meantime is now tutoring Max, who has come back to New York from Idris. 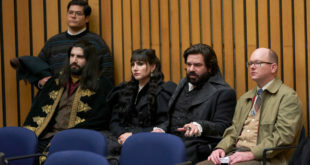 However, she’s called to a mission to talk to Raphael about the killings and has to tell her younger brother that he needs to stay put for the night but their lessons start tomorrow. She goes to meet Raphael to find out if he has any information on the killings and he tells her that there is no way that vampires would remove runes from the Nephilim. In the past Shadowhunters had hunted Downworlders for sport taking fangs, claws, and warlock marks as trophies and his kind swore that they would never allow this kind of horror to happen to any creature again. Isabelle senses that the vampire is holding something back and begs him to tell her since they are desperate and need to capture the killer. He relents and explains that in the 80’s, Downworld came together and gave the Clave demands that were refused. Things got ugly and he overheard a Seelie knight tell the Seelie queen that the only way they would be taken seriously is to show the Nephilm how dangerous they were. In addition, he suggested that they take their runes. Who is this fairy? Meliorn (who is rocking his scar btw)! Izzy is able to track him because she had a shirt of his. They find themselves by the port where loads of containers are housed. Raphael senses that they have company and it turns out to be Max who tracked Izzy through a hair tie. She tells him to stay put when the New York clan leader smells Nephilim blood. The two go to investigate and find Meliorn there kneeling over the dead body. The fairy claims that he didn’t do this and that he had been tracking the real killer who was a Seelie like him. Isabelle decides to trust him and asks Raphael to take Max back to the Institute. Unfortunately when she returns to his hiding place, her brother is gone. Uh oh, he’s been kidnapped! He gets taken to a lab of sorts where there are jars of eyeballs and other body parts. We then discover that the murderer is none other than Kaelie Whitewillow, the fey that Jace had a fling with. She’s super pissed because one of the Downworlders killed by the Soul Sword was her brother. She’s decided to kill Shadowhunters as revenge for taking away the only family she had left. Thankfully though, Izzy, Raphael, and Meliorn arrive and through teamwork they are able to kill the faerie and free Max. Back at the Institute, Isabelle debriefs Jace and Alec and explains how Kaelie had vampire fangs, werewolf claws, and other items to make the murders look like a Downworld uprising. 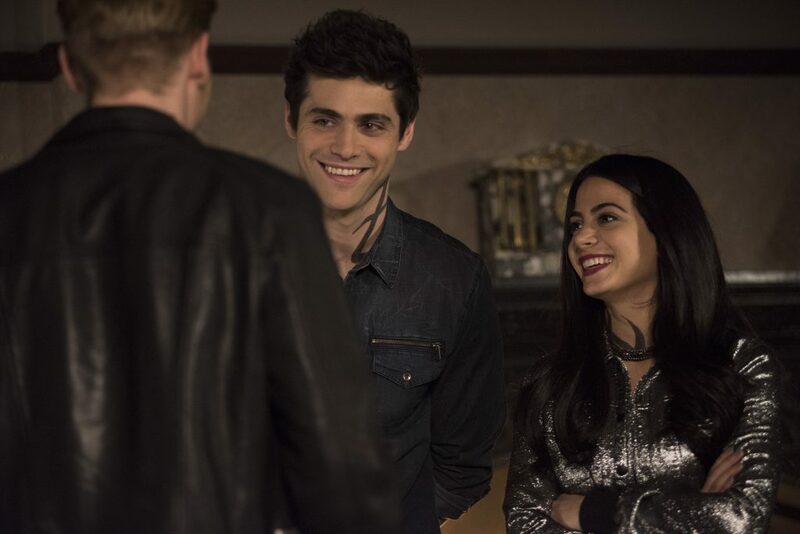 Jace congratulates her on a great job then proclaims that his first order of business as the head of the Institute is to give Alec the job instead. He’s realized that he’s a soldier while Alec is a leader. He also admits that Alec was right that all the citizens of the shadow world were a mix of human, angel, and demon blood and if they let the Clave forget that then they deserve a revolt. 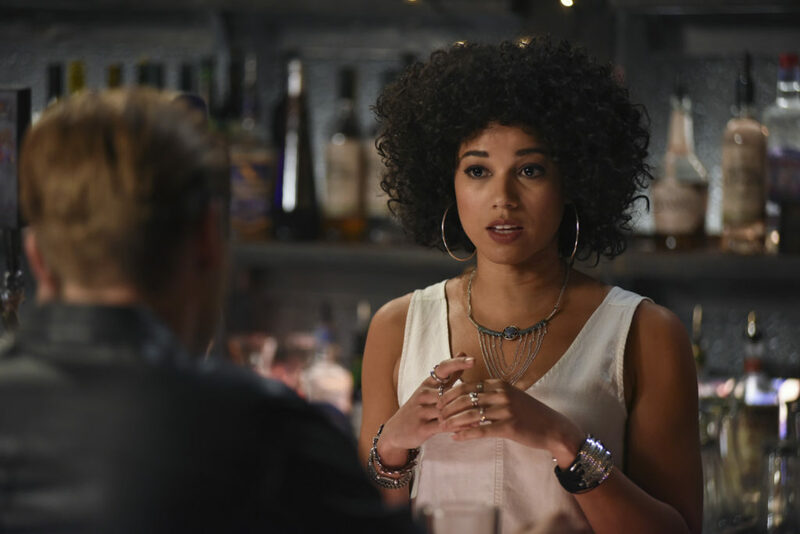 Jace’s first assignment is to remove the tracker on Maia at the Hunter’s Moon. 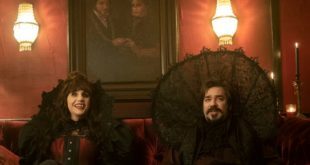 There, Simon is playing his debut solo gig where it’s a packed house because a number of vampires now want to be a part of his clan because he’s a daylighter. There had been some kind of prophecy that one day a great vampire leader would arise and that he would be able to walk in the sun, so now they all think that’s Simon and want to be his groupies. Maia is taking trash in the back alley when Jace finds her and he explains that he’s there to remove the chip. Once it’s out of her system, the werewolf is sassy as ever and rightfully says that she’s not going to say thank you because Nephilim were the ones who made the mistake. He apologizes again and Maia confronts him with the truth that he was willing to let all of Downworld burn because he’s still in love with Clary, to which he denies of course. She challenges him to prove it and Jace grabs her and they start a very aggressive makeout session in the alley. So romantic. Imogen is totally lying that the Soul Sword is being purified. It’s still missing but in order not to cause a panic and to show that they are still in control, the Clave is pretending that they still have it in their possession. Simon and Luke have the most awkward conversation ever. Be safe kids. Holy crap Maia and Jace! That makeout scene at the end of this episode was hot. It’s definitely an interesting pairing and purely physical. Both of them still have lingering feelings for other people, ahem Clary and Simon and are using the other to get out some pent up physical frustration. Go for it hot people. Go for it. Dot and Magnus caught up and we found out that the two dated a long time ago. While she was interested in rekindling their romance, Magnus reaffirmed that he was in love with Alec despite their disagreements. Alec coming over to Magnus’s to tell him that he was wrong and that the other man would never have to prove anything to him, about time Alexander! Finally Malec says their I love you’s and I squeal! Where is Sebastian this week? Is he laying low to not get the attention of a certain Inquisitor? Surely Imogen would know of Sebastian Verlac from the London Institute? It’s really interesting to see an extremist like Valentine that wants to eradicate the world of Downworlders versus Imogen who wants to control them. Neither is right because while there are terrible vampires, werewolves, warlocks, and faeries, there are also horrible nephilim.